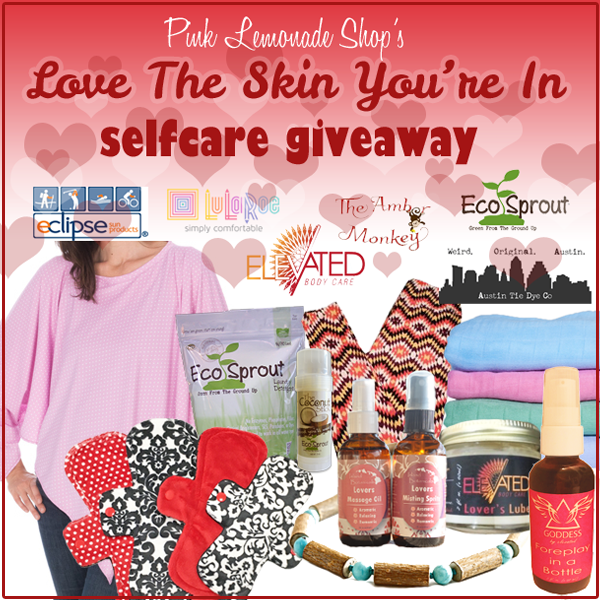 Mommy's Favorite Things: Pink Lemonade Shop's Love the SKIN You're In #Selfcare Giveaway! Pink Lemonade Shop's Love the SKIN You're In #Selfcare Giveaway! Enter to win $300 in personal care products just for YOU! Self care is important and often overlooked and this 'Love the Skin You're In' Giveaway features all the products you need to treat yourself! Pink Lemonade Shop has partnered with some amazing brands and businesses to highlight some of their amazing self care products. These products will make you feel pampered, pretty, healthy, cozy, safe and feisty! So who are these amazing sponsors and what are their prizes? This prize pack is valued at approximately $300. This contest is open to the USA & Canada. Contest is open 2/1-2/10/17. Winner's entries will be verified and the winner will be notified by email. Winner will have 7 days to claim their prize. Prizes will ship separately from each sponsor and delivery times may vary. Enter to win using the Rafflecopter entry form below. Feel free to complete as many or as few entry methods as you'd like.